Life’s much sweeter when you make someone smile. Start with our sunny yellow roses blooming inside a sleek silver planter. 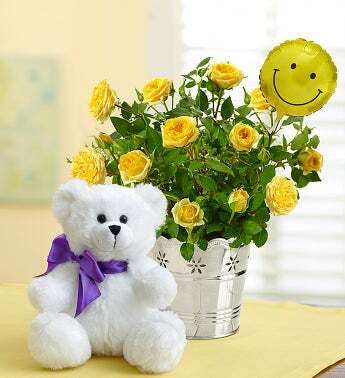 Paired with a cuddly plush bear and bright, smiley face balloon, it’s the kind of gift that will have them beaming with delight. For an extra special surprise, add a box of delicious Harry London® chocolate. Delicious assortment of Harry London® chocolates in a silver foil box that reads: “Sending You Sweet Smiles”; 6 oz.